Shopping, beach and restaurants galore all within walking distance... Do you know anyone looking for an incredible location to live, work and play all out of one building in Downtown Delray? 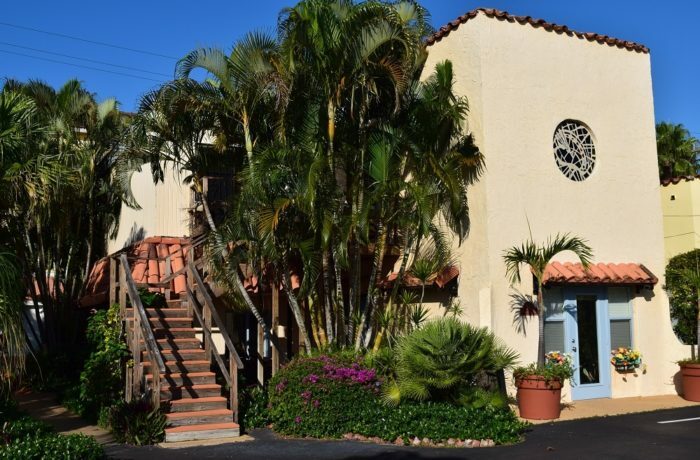 This beautiful Spanish-Style building has a studio apartment upstairs and a retail/office space downstairs. Or, redevelop and build a 4-story building. Currently the upstairs is rented by an internationally known artist Ralph Papa where he has a studio and the adjoining property next door is the 4th generation Varga Sculpture Studio now taken over by the late great Frank Varga's son Michael. This family migrated from Hungary and have made a mark on this world with their sculptures. They have sculpture classes next door to this building. Michael is a master 4th generation Sculpturist. If you know an artist looking for a place to buy, this is the spot. This building was currently owned by Louise VandenBergh Altson, the late and famous portrait artist who worked with George & Barbara Bush, Tommy Dorsey the famous Conductor and Composer, the DuPonts and the Woolworth family just to name a few. Google her art, she was amazing. Also, the Mosaic Stained Glass Window in this building was created by the late Conrad Pickel, another prolific artist of his time. They no longer make this type of stained glass, so it is rare and priceless! One of Conrad's commissions was the Resurrection of Mausoleum in Chicago, IL and is the world's largest stained-glass window according to the Guinness Book of World Records. His mosaic in this building is one of his originals. $1 billion in new developments are going up within a few blocks of this parcel. New iPic Theater as well as the new Aloft Hotel/Condo, Koulter/Marriott Hotel, & Atlantic Crossings Mixed Use (82 Luxury Condos & 261 Apartments) all on Federal Highway just south within walking distance. Delray is exploding and there is not much inventory for properties in the heart of downtown. This is a perfect spot to build your new art studio, business office, mixed-use or retail building. Or, potentially redevelop this property naming it Artipelago. Prime location a few blocks from the bustling downtown area of the famous Eclectic Atlantic Avenue in the heart of Delray. Art galleries and restaurants throughout as well as condos, retail and office buildings all within walking distance.